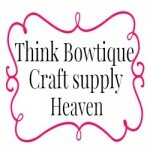 Welcome to Think Bowtique your #1 stop shop for hair bow, headband making and craft supplies in Australia. My name is Melissa and I am a mother to 3 very active boys and a wife to a very caring husband. It was not until I had my third son and gave up working completely that I starting creating crafts for the School fete craft stall. I was trying to find something different to make for the stall, searching google I found some hair bows. While looking for hair clip supplies at one of our local shops I was asked to sell hair bows wholesale to the shop. The hair bows and accessories became very popular and I was in need of large amounts of grosgrain ribbons and hair accessory supplies. Unable to find a supplier that sold more than 5 metres of grosgrain ribbon in Australia I decided to setup my own online store. Think Bowtique began Trading in May 2011. I saw a need for bulk grosgrain ribbons and elastic's to be available in Australia. I knew there had to be others looking for more than 5 metres rolls of grosgrain ribbon in Australia. The time it took for supplies to arrive from the US was a pain. So I set about registering Think Bowtique and setting up a website. Having an online store is not just simply adding stock to a website and selling them. There are so many aspects that happen behind the scenes. I knew before I started trading that I had to learn about SEO - Search engine optimization so my website could be found. I have spent many hours researching on the internet. I enjoy learning about source codes and improving the visibility of my website. While I have learned a lot in 3 years there is so much more to learn. Running an online store is never boring. When I set up my first website it did not have a cart. I used Pay Pal buttons and edited the source codes to get the buttons to function the way I needed them to. However once we begin having to add GST to our sales it was time to upgrade our website to a host that could provide these functions. The new website was setup completely different so this took awhile to make the adjustments to the website to get things the way I needed. I am constantly looking for ways to improve the website. The host who is always there when I need help and have come to my rescue a few times when I have crashed the website making changes. It may have been quicker to have hired help with the new website however I have enjoyed the learning curve. We started stocking 45 metre rolls of grosgrain ribbon as soon as we opened. Very soon we began increasing our range of colours as well as ribbon widths and started adding other products to our range. Satin ribbons, headband elastic's, fabric flowers, headbands, hair clips are all part of our huge range of craft products available. We are always adding new products and have recently started stocking tulle. You will find an extensive range of ribbons, elastic's, flowers and rhinestone buttons in our online store. Most products are available in a huge range of colours and sizes. We are always sourcing new supplies. Most of our supplies are available in bulk quanities if you need a larger amounts than listed just pop us an email to melissa@thinkbowtique.com and we can give you a quote. I hope you enjoy our online store. If you have any questions please send me an email I will be happy to answer your questions.